Arriving home from a sun soaked holiday is never fun… especially when you arrive home to rain, a suitcase full of washing and an empty fridge. Sad times indeed! Luckily for me, La Tasca had invited me to sample their new menu at the Manchester Deansgate restaurant upon my return, thus saving any worry for immediate food shopping and the review helped keep the holiday buzz alive! It so happened to be one of the hottest days in Manchester so far this year and the Deansgate stretch of bars were bustling at 3pm on a Sunday afternoon. It appeared that people preferred to be out in the sun as opposed to sitting inside as the restaurant was relatively quiet and meant that I could peruse the menu and soak up the atmosphere without feeling rushed. The menu is rather extensive with lots of delicious tapas dishes covering meat, fish and vegetable ranges. If you fancy something more filling then Main Meals including steaks and burgers are available… alongside gorgeous Paella dishes too. Calamares (£5.95) – Crispy Squid served with an alioli dipping sauce. My go to starter, I absolutely adore calamares and was not disappointed by how crispy the coating was and how moreish the bitesized pieces of squid were. Smoked Haddock Croquetas (£5.00) NEW – Smoked haddock, onion, potato and parsley croquettes coated in crispy panko breadcrumbs and served with alioli. The croquettes were so soft, fluffy and easy to cut through and the taste of the haddock was not overpowering. Not a tapas that I would usually order but am so glad I did, it was a filling dish with lots of complementary flavours. Lemon & Thyme Chicken (£5.50) NEW – Roasted chicken breast with lemon and thyme dressing served on chargrlled asparagus. I was advised of a twenty minute wait with this order, however found that it did arrive a lot sooner, but the wait was definitely worth it. What a fantastic new addition to the tapas section. The succulent chicken was tender and cooked perfectly with the asparagus adding a little crunch to the dish. Patatas Bravas (£4.50) – Cubed potatoes with a spicy sofrito tomato sauce and alioli. This is a staple on any tapas menu and a great side for all the meatier dishes. I have to admit that the spicy sauce was too spicy for me and usually I can handle it. Chorizo (£5.50) – ‘Dulce’ chorizo with caramelised red onion. garlic and thyme. I’m a huge fan of chorizo and it would have been rude not to indulge in this dish. The saltiness of the chorizo and the smokey flavour worked so well with the onion and you really do feel like you get your monies worth with this dish. Pork Belly Croquetas (£5.50) NEW – Slow cooked, hand crumbed pork belly pieces served with a membrillo quince paste. Slow cooked pork belly is the best, it felt so naughty to enjoy the tender and beautifully cooked pork pieces. I could quite happily have eaten a lot more than I did! Gambas Pil Pil (£7.00) – King Prawns cooked in garlic, chilli and olive oil, served with bread. The prawns were very succulent and the chilli really added to the flavour. Churros Sharing Platter (£8.95) – 8 x Churros served with marshmallows, strawberries and a chocolate dipping sauce. What can you say… the Churros were still toasty warm and absolutely delicious and devilishly moreish. Any calories were forgotten about. Despite a fantastic array of dishes covering all bases, with tapas, there will always be another dish you wish you had tried! For me, this was the Pescado Rebozado (£5.00)- deep fried white fish in an Alhambra Reserva beer batter. The table next to me ordered this and it looked divine – huge chunky pieces of battered fish… I shall know for next time! I am terrible with tapas, always ordering far too many dishes and forgetting how easily they fill you up. However there is always room for dessert and the Churros really were a lovely way to end the meal, whereas normally I would order a coffee. It has been many years since I dined in the Deansgate La Tasca, but it did seem slightly brighter in there with a homely Spanish feel. I love the fact all the serving plates are of different designs, adding to the authenticity of La Tasca. The service was impeccable and the whole experience renewed my love for tapas. 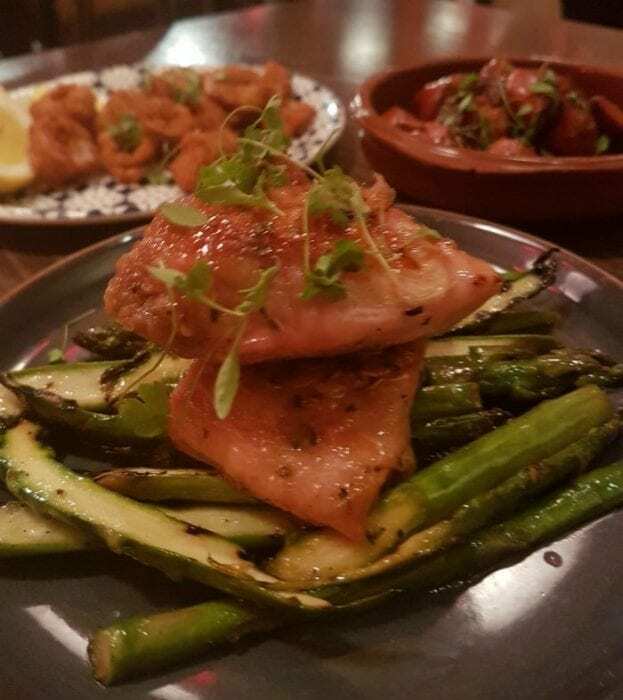 There is a special offer of 3 tapas dishes for £14 or 6 for £28 – for the amount of food you receive I actually found this to be very reasonable and you can easily add extra tapas or sides if you are in a group. The restaurant is perfectly situated in the heart of Manchester City centre, surrounded by bars, making it a fantastic pit stop for food before a night on the town. The whole dining experience at La Tasca was fantastic and the food seriously tasty – I am already looking forward to my next trip there. The only thing I would change about the event would be my dining companion. Betty Crocker Cake Mixes – Perfect For Easter Baking! Cooking With Frozen Food… Proving How Easy It Is!